It’s easy to forget the purpose of Christmas. This time of year we have so many things that can get in the way: commercialism, traditions, even family and church commitments. To find the real purpose of Christmas, we have to fast forward from the shepherds, the wise men, and the dirty stable. We have to go to a statement Jesus made during his adult years about why he came: “For the Son of Man came to seek and to save the lost” (Luke 19:10 NIV). The reason we celebrate Christmas is because Jesus came to earth to seek and save the lost. In the book of Luke, Jesus used three stories to demonstrate what it means to be lost: the parables of the lost sheep, the lost coin, and the lost son. They each teach us that when we’re disconnected from God, we lose direction, protection, potential, happiness, and our home. That’s why this season we’re making our greatest effort to bring people into God’s Kingdom by filling his house—the “F” goal of Daring FAITH. Imagine the joy that comes with reaching one more for Jesus. With less than six months left in our three-year giving campaign, our church family is sprinting toward the finish line to reach our five FAITH goals. 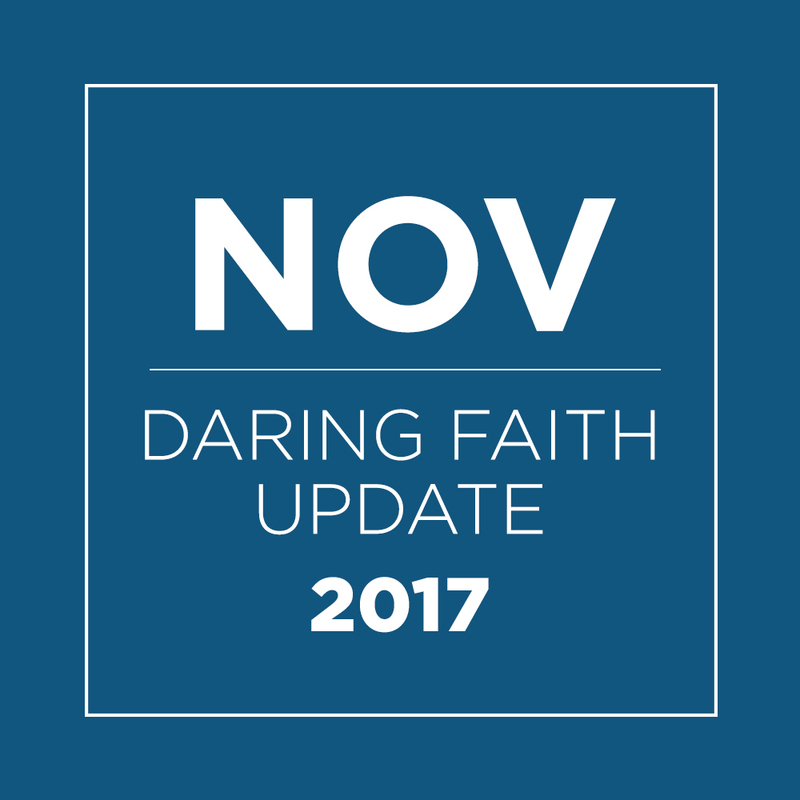 Check out some of the milestones that happened in November because of your prayers and daring faith. During 40 Days of Prayer, Saddleback’s Social Media Team partnered with our Online Campus Team to test Facebook LIVE as another way for people to engage with our weekend services. The statistics were staggering! A total of 55,704 people were reached online through this single LIVE-feed. Click HERE to read more about the success of this pilot study, and how you can be part of sharing the message of hope with your online community. As we continue to grow our church family, we’re leaning heavily on God’s direction and the shepherding of our campus pastors. Among them is Brandon Reed, the new Campus Pastor of Saddleback Rancho Capistrano. November 1st marked Brandon Reed’s official start date, followed by a commissioning by Pastor Rick on November 4th and 5th. Click HERE to read about Pastor Brandon’s remarkable journey of faith that led him to this leadership role. Last month we celebrated the one-year anniversary of Saddleback San Diego and reflected on all the ways that God has blessed this campus. Less than a month after that big event, Campus Pastor Jeff Gonzalez announced that he’ll be leaving the San Diego team to help Fill God’s House in Coachella Valley. Next spring, Pastor Jeff will help launch our 20th Saddleback campus in the Palm Desert area! While God opened a door for this new Saddleback location, he also prepared the way for the next Campus Pastor—Phil Sanchez—to take the helm of our San Diego family. Previously serving as Newport Mesa’s Worship Leader, Pastor Phil jumped right into the San Diego position on December 3rd. Click HERE to read about God’s perfect timing in this transition, and the vision Pastor Phil has for Saddleback San Diego. In preparation of the launch of Saddleback Yorba Linda, Campus Pastor Santosh Swamidass and the entire Saddleback Yorba Linda team stayed busy building momentum through pre-launch events and gatherings including preview services on November 12 and 19. At the December 3rd Grand Opening, 1,533 people attended and nine new believers committed their lives to Christ! Saddleback Buenos Aires is working with architects and general contractors to develop a plan to expand their current building. Please pray that God would give them favor during this season of growth. Saddleback Corona is working toward their own three-phase Daring Faith project that involves relocation, upgrades, and eventual expansion. Averaging 450 people per weekend, Saddleback South Manila will also be relocating this coming spring. Stay tuned for details about the official move in dates and grand opening celebrations of these three campuses. Through Saddleback’s military ministries, our church family is able to provide encouragement and strength to those who have served our country or are in active duty. To honor the sacrifice of our veterans, Saddleback hosted several activities on Veterans Day weekend including a Veterans Ministry Fair, a special prayer by Pastor Rick, gift packages, and more. Click HERE to read how our church family has brought awareness, resources, and support to veterans and military families around the world. There’s such fulfillment and reward when campuses personally commit to working toward our five FAITH goals. This month, Saddleback Irvine North focused on four of our goals starting with “filling God’s house” with 2,500 people at their Fall Fest celebration. For the “A” goal, their members donated 125 bags of nonperishable food items during Saddleback’s Holiday Food Drive. Working toward the “I” goal, they utilized mysaddleback.com to access online resources for 40 Days of Prayer. In one month, their campus started 100 new small groups, ranging from young adults to the Egyptian community! For the “H” goal, Irvine North hosted an International Food Celebration to highlight Saddleback’s value as being an all-nation congregation. With over a thousand people in attendance, the event featured dishes from 10 countries and a special presentation about cultural diversity by Irvine Mayor, Donald Wagner. It takes love, compassion, and commitment for a community to fight against gangs and gang-related crime. That’s why for over a decade, Saddleback has shared the message that these children matter and have purpose. On November 15, over 100 Saddleback volunteers helped deliver 850 Thanksgiving dinners to vulnerable students who have worked toward achieving high grades. Click HERE to read the touching story about how this program has helped increase school attendance, lower crime rates, and encourage more children to pursue their dreams. Watch video highlights from this special Thanksgiving event. Big things are happening to interconnect our growing fellowship through new technologies. This spring, we announced the launch of our Interconnect Room used to train our members with video conferencing and two-way interactive broadcasts. The latest in tech-facility news is the recent unveiling of Saddleback’s recording studio. Click HERE to read how the Production Team was able to turn a storage room into a state-of-the-art facility for recording DriveTime Devotions, radio spots, Saddleback Worship EPs, and more. On November 12, Saddleback Kids (SK) hosted a special training for Saddleback Kids Coaches. Held at our Rancho Capistrano campus, the event trained and equipped both new and existing SK leaders from all of our Southern California campuses. They also gained a better understanding of SK’s safety procedures, how to minister to children, and the big picture of why we do what we do to reach the next generation for Christ. After The PEACE Plan’s success in Rwanda, Saddleback’s Purpose Driven (PD) and PEACE teams have been actively laying the groundwork to implement the same training and national strategy across the world. In addition to 20 African countries, others committed to launching the PEACE Plan include Brazil, Cambodia, Costa Rica, El Salvador, India, Mexico, The Philippines, and Russia. Implementing the PEACE Plan not only builds and unites healthy PD churches, but it transforms entire communities and helps take the Good News to the last unreached tribes—the “H” goal of Daring FAITH. Instrumental in sharing this global movement is Saddleback’s PEACE Plan Pastor, Mike Constantz, who recently traveled to Canada, Mexico, Costa Rica, El Salvador, and Colombia. Click HERE to read how Saddleback is building a network of healthy churches, and how these ongoing efforts are just the beginning for the Global Purpose Driven movement. Thank you for your commitment to Daring Faith. YOU are the reason we can make a difference through these five God-inspired goals. HERE is just one story that represents hundreds of lives that are being transformed because of your sacrifice.